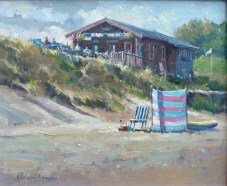 Robert Brindley's Blog: Residential Courses with West Norfolk Arts...Places Still Available! 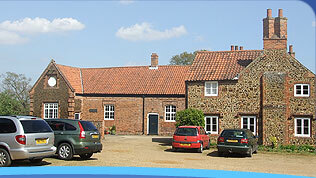 Residential Courses with West Norfolk Arts...Places Still Available! Following a very enjoyable 8 days residential course in Venice, I'm looking forward to tutoring another 2 courses for West Norfolk Arts. The venue for both residential course will be the fully equiped studio situated in the heart of Castle Rising, a delightful conservation village bordering the Royal Sandringham Estate. The village provides an abundance of architectural and historical interest, and a multitude of painting opportunities, for visitor and student alike. Within close proximity are nature reserves, woodlands and the North Norfolk coast; all designated areas outstanding natural beauty. The Watercolour (17th to 19th August) course will cover many aspects of painting Watercolour Landscapes including subject selection, composition, colour and the importance of tone. Consideration will also be given to the pro's and con's of working from photographic reference. I will demonstrate my method of painting harmonious, atmospheric watercolour paintings, developed from an overall, diffused 'Wet into Wet' wash and the subsequent application of colour and detail. 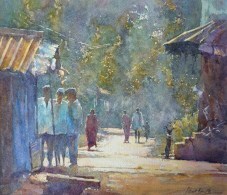 Suitable for students with some previous experience in watercolour painting . The Oil painting ( 31st August to 2nd September) course will deal with how to paint small, rapidly executed oil paintings using a limited palette of colours. Subject selection, composition, colour and the importance of tone will be discussed. Consideration will also be given to the pro's and con's of working from photographic reference. I'll begin each day with a small demonstration painting of varying subject matter, outlining my method of working.